Here’s the plot line: One of the richest men of the Gilded Age decides to build a railroad through hundreds of miles of Florida coastline, creating luxury hotels along the route, then go one better by taking his train across hundreds of miles of water. He would take it to the place where America either begins or ends, depending on how you set your compass: Key West. An impossible feat, he was assured. Advice he would wisely—or not—ignore. This is the true tale of what Henry Flagler, the man who made John D. Rockefeller and himself Croesus-rich through Standard Oil, determined to do in the early 1900s. Ask a Conch, a native of the Florida Keys, about Flagler’s Over-Sea Railroad, and he or she may tell you where you can still see some of the grandly arched bridges, or how to find the one work camp still standing. But for most of us—even those of us who have lived in Florida awhile—the story was unknown until Les Standiford decided to tell the tale. His book, Last Train to Paradise, first appeared in 2002, sold some 200,000 copies and this year was selected for Palm Beach County Reads. 2012 makes the one-hundredth anniversary of the completion of Flagler’s impossible dream. Levenger Press editor Mim Harrison just finished reading this edition. She talked with Les about his writing of the feat once known as Flagler’s Folly. Come sit in on the conversation. Levenger Press: There is much talk these days about enhanced eBooks, where videos and other links are embedded in the electronic book. I found reading your centennial print edition just as satisfying because of the preponderance of maps and vintage photos. Maybe more so, because of the immersive experience that print books engender. How did these old photographs influence you as you were writing the story? Les Standiford: When I am writing, I am pretty much living inside my head, reinhabiting my own memories, and imagining being in another time and place. To me the archival photographs are an interesting complement to the words in the book, but to tell you the truth, I sought out most of them after the book was finished. I think some of the photographs are really spectacular illustrations of places and people referred to in the narrative, but what primarily influenced me during the writing were the written accounts of workers, storm survivors, Keys residents, etc. LP: Even though many people who’ve been to Key West find it paradisiacal, did you intend your title of Last Train to Paradise to have a certain irony? Les: Not really. While I understand the laments of some who have witnessed the T-shirtification of Duval Street over the past decades, there is no erasing the essential physical beauty of Key West. I think the enduring appeal of the book is attributable to the fact that most visitors still find the Keys and Key West a paradise. LP: That famous Key West resident, Ernest Hemingway, makes a cameo appearance in your book. Why do you think he never wrote a story that brought in the building of the Over-Sea Railroad? Les: That's an interesting question. I can only guess that it is because Hemingway was never much of an historical novelist and was always drawn to subjects that he had personally experienced. He wrote powerful journalistic accounts of the demise of the railroad in the hurricane of 1935, but even that never turned up in the fiction so far as I am aware. An interesting modern-day novel that uses the ‘35 storm and references the Over-Sea Railroad is The Cypress House, by Michael Koryta. LP: You knew the general story before you started your writing. What were the biggest surprises as you got into your research? Les: For one thing, I did not realize that Henry Flagler had been the number 2 man in the making of Standard Oil. And I had no idea, really, of the immensity and difficulty of building that railroad across the water, nor did I really appreciate the terror of the night the Labor Day storm swept across the Matecumbes [Keys]. Researching and writing the book made me appreciate this aspect of history—and history in general—far more than I ever had. Trying to recreate such events with the same force and power that I have always tried to bring to my fiction has made me a better writer and a more fully informed person. LP: If Last Train were a movie, who would be the stars (other than Key West herself, of course)? Les: Another interesting question. Maybe George Clooney as Flagler and Johnny Depp as Theodore Roosevelt, Flagler's arch-enemy. Kate Winslet for Mary Lily Kenan Flagler, and Charlize Theron for Ida Alice Shourds Flagler. Robert Downey as Hemingway. Roll ‘em! Now to you, dear reader—have you been to Key West, and had you heard about the Over-Sea Railroad? I’d love to hear. Just click on the Comments link below with your submission. (If you’re reading this as an email, click here and you'll connect to Comments). Ice cream cones were supposedly invented by accident. The story I’ve heard is that an ice cream vendor at a busy fairgrounds ran out of the paper cups he was using to sell his ice cream and in desperation turned to another vendor who was selling waffles. He served up his ad hoc treat, and the rest is culinary history. If this story isn’t true, it should be, because it’s a sweet illustration of a larger truth: sometimes adding two good things gets you something great. This is, in fact, just the case in the story I’m about to tell you about how Loop the Lake for Literacy came about. I’m old enough to remember when walk-a-thons began. It was around 1970, while I was in high school. Some group of do-gooders at Helix High in La Mesa, California, where I was a sophomore, were all excited about walking around the high school track and were trying to talk their fellow students into “sponsoring” them by paying 25 cents a mile. “What a stupid idea,” I remember saying to my friend Jim. And he agreed, since we both prided our young selves at being cynical about school spirit (despite us both playing trumpet in the band and doing our part for such spirit). My youthful cynicism, as it turned out, could not have been more off target. Decades later we all can testify to the plentitude of athletic events now routinely used to raise money for worthy causes. There are so many of these Walk-a-Thons, Run-a-Thons and Bike-a-Thons for the simple reason that they work. Moreover, I’ve come over to the other side and regularly participate in such events myself, accelerating in the last five years with rides for MS, diabetes, and especially for cancer research. I witnessed for myself these recent arrivals from the Caribbean and Latin America work hard to improve their reading and speaking skills. They were tackling a difficult language we all take for granted. After a year or so, I heard about a program the coalition runs out in the western, agricultural part of our county. I took a day off and drove the hour out to Belle Glade. There I tutored Latina women whose children were gaining reading skills in the same facility. It’s hard to believe that Belle Glade, whose city motto is, “Her Soil is Her Fortune,” is in the same county as plush Palm Beach, with its Rolls Royces and mansions. When I called Darlene to tell her how impressed I was with the small facility and the diligent students, she explained to me that there was a waiting list of people who want to come get help, but there isn’t enough funding. After tutoring, I took some time to drive up to the dike that surrounds Lake Okeechobee, the gigantic lake that dominates this region like The Great Salt Lake dominates Utah. This is the “O” that you see on Florida maps. After seeing how beautiful the area was, and how devoid of people and cars (in vivid contrast to where we normally ride along the picturesque but dangerous A1A near our home), I easily convinced my riding buddy Rob Kennedy to do a ride around the lake. Together with Rob’s brother Brian, and my sons Cal and Corey, we went out on a Friday night at the end of May 2009, and spent the night at Roland Martin’s bass fishing lodge, nestled on the south shore of the lake. Early the next morning, we set out on four bicycles and one white van for support, and began our expedition. The sun beat on us, various reptiles greeted us, and thunderstorms made us run for cover three times, including for a long lunch in a friendly restaurant whose bartender didn’t mind us coming in soaking wet and dripping on her concrete floor. In all it took us 12 hours to complete the 120 miles. We were sweaty, sore and exhausted. Somewhere along that ride, during one of the breathtakingly beautiful stretches when the cloud-painted skies stretched forever over the glistening lake, the idea struck: We have got to get other cyclists out here to experience this—and why not team up with a great cause.... but of course—the Literacy Coalition. A month later, I went to lunch with Darlene and floated the idea. A gleam appeared in her eyes. As it turned out, her board was searching for another major event to raise funds for the coalition, and perhaps this was just the thing. As Darlene, Rob and I discussed the idea with friends and associates, we met with universal enthusiasm. Partly it’s because many people who live in our congested coastal cities of Florida haven’t ever seen Lake Okeechobee, and they’re curious. And partly, it’s the obviously worthy cause of supporting literacy efforts. The many people we spoke with who live in the Lake Okeechobee area are enthusiastic about outsiders seeing just how inviting their region is. The locals who live in Belle Glade, South Bay, Pahokee and Clewiston think it’s important that people slow down and take some roads less traveled, to experience the beautiful and important ecosystem we call the Everglades. And that, my friend, is the story of how Loop the Lake for Literacy began. And now a flock of dedicated, hardworking, talented people are the reason we’ll be able to pull it off and make it soar. To me it sounds like ice cream in a waffle, with chocolate syrup and sprinkles. Or maybe you’d rather try local bass and hush puppies. We invite you to come taste Loop the Lake for Literacy for yourself. Many of us from Levenger will be riding April 2nd. Come along for the ride—or just support a good cause if you’re so inclined. The rewards, I promise, are sweet. According to reports, the Chinese government has for years now been working to clean up non-standard English translations on signs in anticipation of the attention soon to be focused on Beijing. My son Cal, who studies Chinese in college, is somewhat sad about this. He says he will miss the quaint, odd, and sometimes undecipherable English he used to encounter on his various trips around China. 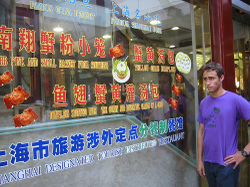 Here are some of the Chinglish signs we photographed four years ago, when we traveled to Beijing and Shanghai. These may already be relics. The translation Cal ponders on the window of this restaurant reads: “Dumpling stuffed with the ovary and digestive gland of a crad.” Yum! Of course, what would be even funnier would be English attempts to write Chinese signs. For more information, see the interesting entry in Wikipedia. Levenger produced a replica of the time cam from this clock. Click here for more on its meaning. Here’s a link to www.booksense.com, in case you’d like to buy any of these books from your favorite independent bookstore. We had been warned about the fog. Yet we left anyway at 8:00 am from a cloudy Cairo for our three-hour drive northwest to Alexandria. It was our only day to visit the library. And treacherous it would have been, had our driver not slowed our van to a crawl in the nearly impenetrable fog. But the six of us were all the more delighted when we emerged at seaside Alexandria into brilliant sunshine. 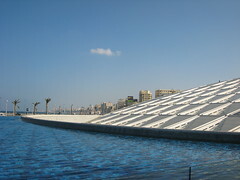 My family was there to have lunch with officials and then tour this shining jewel in Egypt’s crown—the new Bibliotheca Alexandria, which was born by Egyptian presidential decree to fully live up to the legend of its ancient namesake. Mike Keller, head of the libraries at Stanford and one of the board members of the new library, had arranged our visit. He had told me it was a spectacular place but no description could have prepared us for the scale and majesty of what we saw. The buildings, perched on the shore of the Mediterranean, look as though they were transported from a World of Tomorrow. The more we learned of what was inside the stunning architecture, the more awed we became. Sohair F. Wastawy, Chief Librarian, and Noha Adly, Director of Technology, greeted us warmly. Being Friday, the library was closed for prayers until the afternoon, which gave us time to lunch at a Greek restaurant across the crescent bay, right next to the site of the famed Alexandria lighthouse, one of the Seven Wonders of the Ancient World. Yet it was the library of Alexandria, launched in 295 BCE by Ptolemy I, that left the grander legacy. It was part academy, part research center, and part library that drew scholars from around the ancient world. At its height it contained as many as 700,000 scrolls. The library disappeared gradually. One episode was an accidental fire in 48 BCE during the Alexandrian War of Julius Caesar. To make up for the loss, Marc Anthony gave Cleopatra 200,000 scrolls. The arrival of Christianity and subsequent Roman persecutions and schisms in the church made Alexandria a dicey place for a universal library dedicated to science and learning. In 391 CE, Emperor Theodosius banned all religions other than Christianity. In 645 CE, the Muslim conqueror Caliph Omar effectively did the same in the name of Allah. Beyond accidental and deliberate destruction, as Matthew Battles has written, “centuries happened” to the library. Gradually the ancient Greek scrolls became incomprehensible to readers. Five centuries was, and still is, a long time for a library to last. The new Bibliotheca Alexandrina is a chance to begin again with a library “Born Digital,” as librarian Ismail Serageldin says. It is to be a library not only to Egypt, but to humanity. It’s hard to imagine a more noble cause.. The library’s original site is now submerged a few kilometers out to sea from the present shore, yielding up its treasures to underwater archeology. I’ll take you there, virtually, in future reports. I remember learning in high school geography class of the peril faced by the ancient Egyptian temple of Abu Simbel, which had stood since the reign of the pharaohs. Rising water behind Egypt’s Aswan Dam threatened to submerge the four enormous seated figures and the tomb they protected, so UNESCO—the United Nations Educational, Scientific and Cultural Organization—had organized an international effort to dismantle and relocate the temple to high ground. My classmates and I tossed our quarters in milk cartons in faraway La Mesa, California, doing our part to save a part of the world’s history. That memory added to my anticipation when I found myself journeying to see the temple 40 years later, on a brilliant January morning early in 2008. The monument doesn’t disappoint. Even the busloads of other tourists don’t detract from its grandeur. I walked a few hundred yards away, where I could be alone to reflect and take a few whimsical photos. 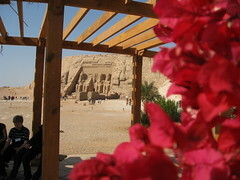 What I hadn’t remembered was the plight of the people who lived in that valley with Abu Simbel. They too had to be relocated, leaving their villages behind. They were the Nubians. Dr. Hala Kh. Nassar, a professor of Arabic literature at Yale, and a guide on our tour, directed me to a slim volume by Haggag Hassan Oddoul, titled Nights of Musk: Stories from Old Nubia. I bought it at the Aswan airport and read it on the flight home. It brought tears to my eyes. We told ourselves that we would have to be patient. The women too would have to be patient. The flood season was approaching, and as you may or may not know, the flood season is nothing more than the long, broad river’s manhood overflowing his banks with the water of life. It mounts the land, and plants are born and udders grow fat. The progress of the Aswan dam and the subsequent loss of Nubian villages reminds us that monumental technological advance often comes with a high human price. The Suez Canal, opened in 1869, led to the bankruptcy of Egypt and British occupation (see Zachary Karabell's marvelous history, Parting the Desert: The Creation of the Suez Canal. And one can only imagine the human cost, so many years ago, of building the Pyramids of Giza. If there were poets of Giza who sang of the struggle to build those wonders, they are lost to us. Fortunately, we still have today not only the monumental Aswan Dam, but the poets of modern Arabic literature who tell the human story.